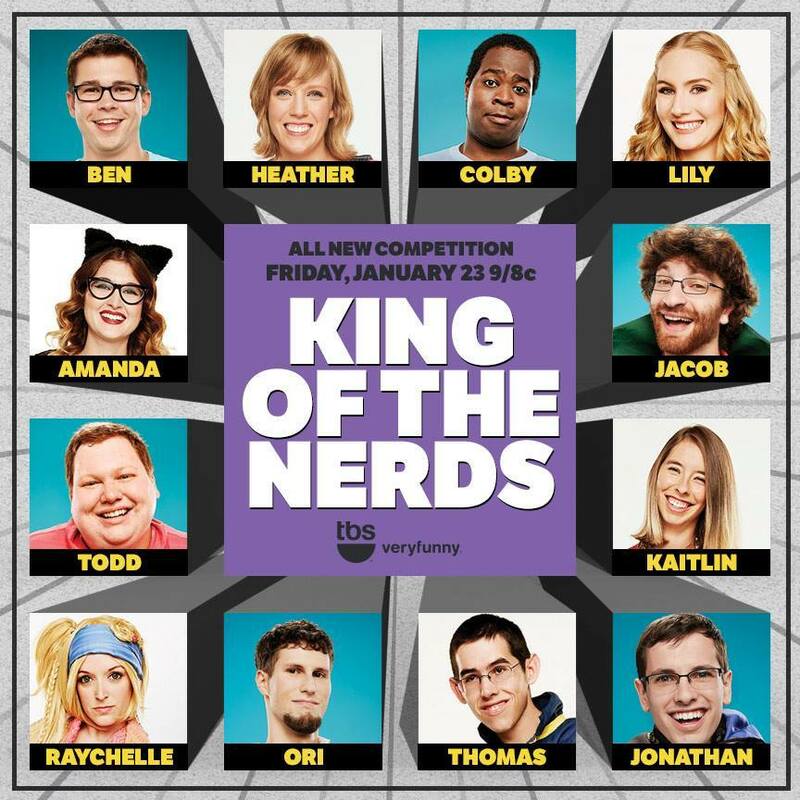 King of the Nerds 3x01 "Judgment Day"
You guys, I almost completely missed that the premiere was happening tonight. Luckily, I happened to have TBS on in the background two days ago and saw a commercial for the new season, so I was able to record it in time. What, you say, didn't you have it set up to record from last season? I would have, sure, but the DVR was replaced and blah blah blah. Anyway! Enough about me. On to the show! It's always tough to comment on who may do well on the show this early in the game. 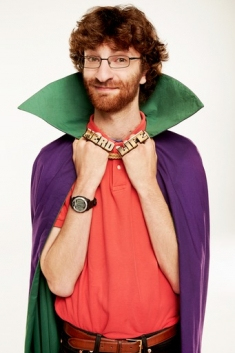 But I was surprised to notice that former Jeopardy champion Colby was a contestant. I was like, hey, that's Eyebrows from Jeopardy! Yes, I gave him a nickname during his tenure on Jeopardy for always having an eyebrow-raising expression going on. He could come off as kind of know-it-all-y on there, but from the brief time we've seen him on KOTN so far, he doesn't seem that way at all. Anyhow, here's what went down. After everyone convened at Nerdvana for the first time, the players were split up into two teams, as is the norm. But this time around, they did not pick their own teams. It's not entirely clear how the teams were chosen, but I suspect they tried to make them evenly matched in all areas. Thus, the blue and green teams were born. Their first challenge? To create a Rube Goldberg type device that would reveal their chosen team names. After spending a little bit of time getting to know one another, they got down to business. In the end, the blue team prevailed in the challenge. Their device was just a bit more creative and whimsical, and I have to agree with the decision. That meant the green team was going to the Nerd Off. Like in past seasons, the team itself would choose one member to go in, while the other team would choose their opponent. So who was chosen? The green team chose Ori, who seemed surprised, but he was the only one as everyone else on both teams seemed to know that was happening. The real surprise came with who the blue team voted in - Jacob. Everyone thought Jacob was safe, that the other team was going to pick either Colby, due to his Jeopardy fame, or one of the girls, because of her cosplay knowledge. But that was all part of the blue team's plan - frazzle them. And, sadly, it worked. The Nerd Off challenge was all about anime, kotaku and, uh, some other third word that I don't remember, which was bad for Jacob because Ori is a big anime nerd, or otaku? Honestly, it seemed like Ori was going to shoot himself in the foot because he wasn't really studying, while Jacob was getting some serious study tips and help from his other teammates. Alas, Jacob did not prevail, which is a shame because he seemed pretty nice. Which leaves Ori to cause more distress among his team members - just what the blue team was hoping for. So I guess they could call that a success. It's hard to say at this point who has a chance at winning the whole shebang. The girls (minus Kaitlin, it seemed) did talk briefly about trying to set up an all-girls alliance that goes beyond the teams, but it wasn't clear if everyone was really into it. Kaitlin seems like she is probably going into a Nerd Off soon just because she is a bit off-putting and intense. I think Jonathan maybe has a chance, and seemed like one of the nicer people there too. Otherwise, it's too hard to tell yet! That's all for this week! Do you have any early predictions or hopes?